Many people have weighed in with different definitions of leadership. Mine is pretty simple—influencing others to accomplish meaningful results. Leadership is not only about what we do on our own but how we influence others to raise their standards and performance to accomplish results. The best leaders inspire, empower, and unleash internal motivation and commitment so people willingly expend effort towards the accomplishment of a meaningful goal. Considering this definition, I want to introduce a two dimensional model of leadership behavior. I call one dimension “Concern for Results.” People who are high on this dimension like to take charge and move people into action. They tend to put their ideas forward and influence the way others think and behave. They get things done and make things happen. People low on “Concern for Results” are more passive, easy going, and reluctant to assert their will. They allow others to take the lead and will let things happen rather than trying to make them happen. The second dimension is “Concern for Relationships,” and has to do with empathy, trust, and building relationships. People who are high on this dimension are sensitive to the needs, opinions, and feelings of other people. They show high levels of respect and even goodwill and affection. They are open-minded, optimistic about other’s motives and capability, and willing to be influenced by them. Those who are low on this dimension are more self-centered rather than other-centered. They are less aware or responsive to other people’s ideas, feelings or needs, and are skeptical about other’s motives and/or abilities. By combining these two dimensions we come up with four styles of leadership: dominate, avoid, accommodate, and collaborate. Of course, leaders can fall anywhere along either dimension of the model and so not everyone is a “pure” or extreme type. However, everyone can be characterized as having natural tendencies in one or another of the quadrants. The chart below illustrates the differences between these four styles of leadership. Dominators (Quadrant 1 leaders) are people who lead through command and control. They tell others what to do and expect them to do it. They aren’t particularly concerned about the needs or feelings of others. Results are more important. They like to run the show with little help or advice. They make their own decisions and tend to micro-manage. These leaders use external rewards and threats of punishment to motivate. “If you do what I want, I’ll take care of you.” “If you don’t do what I want, I’ll make trouble for you.” They are concerned about results and more concerned with ends than means. They are “can do” people who have high expectations for themselves and others and know how to get things done. 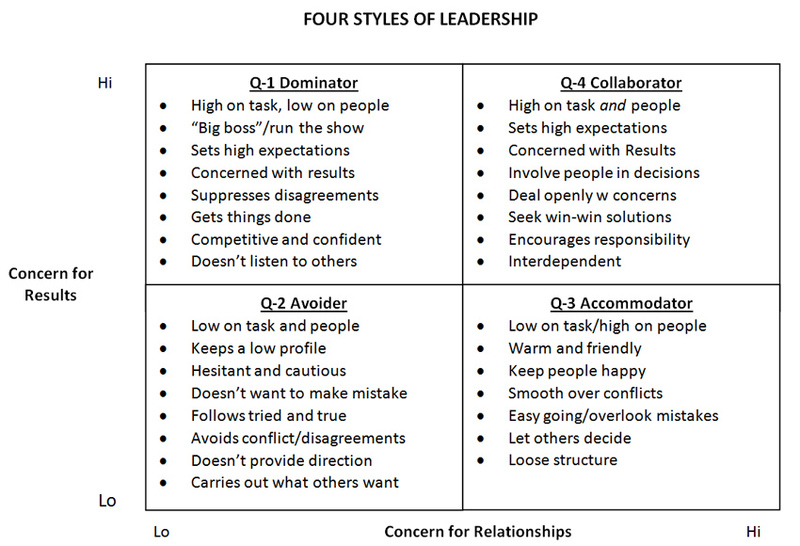 Avoiders (Quadrant 2 leaders) are low on both dimensions of concern for results and relationships. They preserve the status quo, keep a low profile and stay out of trouble. They play it safe by postponing decisions and avoiding conflict. They rarely initiate change but will be loyal and carry out decisions that others have made. Avoiders may be good technically but they provide little direction to others. They stick with proven methods and avoid risks. The followers of these people get very little reinforcement and are unlikely to have a great deal of interaction with their leader. Accommodators (Quadrant 3 leaders) like to keep people happy and maintain high morale. They treat people with warmth and friendship believing that building positive relationships is the best way to motivate people and keep productivity high. They are generally easy going and overlook mistakes. They have a difficult time setting up structure and accountability, preferring to let people figure things our for themselves. These leaders are quick with praise and have a difficult time addressing problems. They tend to be sociable and may spend time chatting about topics other than the task at hand. Collaborators (Quadrant 4 leaders) are high on both concern for results and relationships. They have high expectations, set goals, and yet also seek to involve other people in making decisions and solving problems rather than going it alone. These leaders recognize their own authority and don’t let pleasing others override their opinions. They are more optimistic about people’s capabilities and motives than dominators and so, after providing direction, allow them autonomy and self-governance. They deliberately coach and develop people. They are willing to have difficult conversations when problems occur or differences of opinion exist and do so seeking win-win outcomes rather than imposing their own will on others. An example of a Quadrant 4 leader is Mike Krzyrewski, coach of the Duke Bluedevils basketball team. Krzyrewski was an unknown when he came to coach Duke University in Durham, North Carolina in 1980. He had been an assistant coach under Bobby Knight and a head coach at West Point. But no one knew him at Duke. In his first years, he suffered some humiliating defeats and by the end of his third year, he was booed in his own gym. On March 11th of that year, he suffered the worst defeat in school history, losing a game by a score of 109 to 66. His overall win/loss record was 38 and 47. However, when someone recommended that he recruit new players, and he responded, “Absolutely not. Losing doesn’t make you a loser unless you think you are.” In a few years he was able to turn his program around. Today, Coach “K,” as he is affectionately known, is the winningest active coach in the nation. His record (end of 2015 season) is 1018-310 (.767%). His teams have won 13 conference championships, gone to the NCAA Final Four 12 times, won five national championships, and averaged over 25 wins per season throughout his career. Yet Krzyrewski has consistently made the point that he is more than a coach of basketball. His primary job is developing his players into capable young men. Most of us are in roles in which we influence others. You might be the owner of a small business, manager over hundreds of people, coach of a little league team, pastor of a church, president of a PTO or parent of a small family. Wherever you lead, the best leaders are collaborators who set high standards and build positive, strong relationships. For some, these two dimensions of leadership come naturally. However, most of us need to remember that both dimensions are important. As we do, we’ll expand our reach and influence more people to achieve the best results of which they are capable. Do you know someone you would consider a quadrant 4 leader? How have they influenced you? What kind of leader are you? Where do you fall along the two dimensions of leadership? What might you do to strengthen your focus on results? Relationships? Thanks again for sharing your thoughtful evaluation. The chart is its descriptors are meaningful. In a similar model I found I was not enough of a 9-1 to keep my boss happy. He liked the Dominator style better. Hi Merlin, I have found it to be a useful model for teaching about leadership and communication. There are trade offs whatever style we use. I personally like the trade offs of quadrant IV. Dominators get short term results but we go further when we walk together. Roger, I enjoyed this article very much. I fall into 3/4, but am trying to stay 4. And right now I am working with a 1 who happens to a church leader. Nice going, huh? Anyway, I am tempted to make a copy for him, but will wait and see how we work things out. Thanks, Joe. We have all kinds of leaders around us but hopefully we’re moving away from those who simply want to dominate and tell us what to do. Dear Roger. I attended one excellent workshop of yours. I read your book “”Heroes Choice” which I loved. I thought sharing helpful advice through fictional characters was very clever and effective. You send great and helpful/knowledgeable emails still, serving a mission, etc. You are a very inspiring person and are making your mark in this life and touching and effecting many people for good including myself. I thank you for all you do and your generosity and wisdom!!!!!! Best wishes. Thank you for sharing! !